After 15 long years, Dragon Quest VI is now available outside of Japan and has been remade exclusively for the Nintendo DS. With the massive popularity of Dragon Quest IX, Dragon Quest VI: Realms of Revelation has some pretty big shoes to fill. With a few changes from the original title as well as a fresh coat of paint, this adventure just might be the best yet. 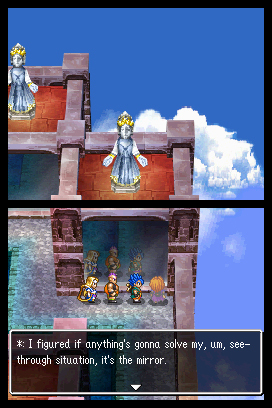 How does this one stand up to not only the other Dragon Quest titles as well as the current market of RPGs on the DS? Here is my review for Dragon Quest VI: Realms of Revelation. There are many RPGs that start off so slow plot-wise and become easy to put down and lose interest quickly in. Thankfully, Dragon Quest VI starts off with a bang and continues to deliver an interesting plot with humorous and memorable moments throughout the entire journey. In this new adventure, you play as a blue-haired hero, who after failing to stop a demon overlord by the name of Murdaw, wakes up with a small case of amnesia. After meeting and partying up with some old allies with the same problems as your own, you soon learn that there are two different worlds and reality becomes a bit more confusing. Over time, more is learned about exactly who your hero and your motley band of allies truly are as you journey to save both worlds from ultimate destruction. 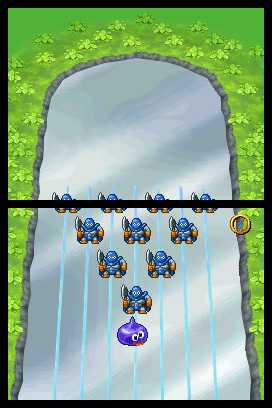 If you have played any of the main Dragon Quest titles, you will instantly feel at home as the whole layout has remained relatively unchanged, with the hero performing one quest after another as he travels from town to town with his party all across the huge in-game world (or in this title’s case, worlds). While getting to know your own character’s backstory in the game is interesting in itself, each party member has a huge amount of depth with a plot that links each together so this title truly tries to give you more of an ensemble cast story rather than just a single character plotline. The reason I say this is due to the astounding amount of character progression throughout the game. At any time, you can tap the B button to hear one of your party members voice their opinions on any conversation or situation you may be in. This is sometimes done with a bit of concern, or just straight up humor, but in my opinion this added even more personality to the already full of life cast and could make even the dullest of moments within the game come alive. Another thing that makes this story worth savoring is the brilliant pacing. Most of the quests you partake in have your party set out on a rather difficult journey which can take up quite a bit of time. To make things interesting, rather simple and optional side-quests come in to change up the pace and add some refreshingly new, but smaller plots and characters. While not all mandatory, these small run-ins are a lot of fun to complete and can be a great breather to the sometimes challenging main game. Towns are filled with citizens, and in true DQ style, each have their own bit of quirky dialogue that can keep you busy for hours as you listen in upon town gossip and make traversing the land more enjoyable and less of a chore. Following suit with the rest of the series, Dragon Quest VI portrays a feel that is just about as classic as you can get when it comes to old-school turn based RPGs. 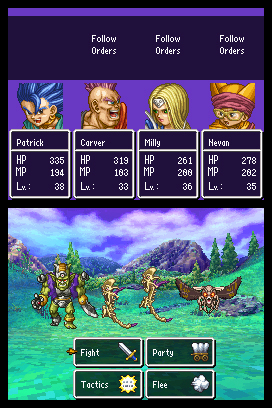 Each character in your party has the standard HP and MP bars, which along with equipment all improve with leveling up. When your party is sent out on a task, random battles seem to pop up without a moments notice and are extremely plentiful in just about every area within the game. You would think that all of these battles might be a bit monotonous after a while, but due to the heavy variation of monsters within the game, battles usually feel somewhat different from eachother do the constant change of strategy needed to take down these foes. That brings me to my next topic which is yet another staple of the Dragon Quest series, grinding, grinding, and more grinding. Random battles happen a lot, but they do serve quite a purpose other than keeping your party on their toes at all times. Each battle gains your team experience, which is of course used to level up. Later on in the game, it becomes more of a requirement to grind and defeat whatever enemy you come in contact with as your attack, defense, HP, any many other factors play a huge role in deciding victory in a tough battle so keeping these as high as possible is a must if you do not want to have to watch your party fall quickly. Magic and skills are also a large part of combat, and in true fashion each character has their own set of abilties that they can learn over time, adding a bit of a payoff for all of your hard work plowing through monsters and slimes alike. With each character having a different vocation, swapping out your team will soon become essential to best tackle certain situations. Vocations can also be changed after a ways through your journey and add yet more variation into the complex yet simple battle layout. Menus are nearly identical to Dragon Quest IV & V, but are still well set up and make everything easy to access at anytime. Aside from a small feature (which we will get to in a moment), the touch screen is not utilized. Instead, the main happenings of the title display on the bottom screen with either a map (out of battle) or your party’s stats (in battle) on the top. Character customization is also another crucial feature that must be used to improve your hero’s (and party alike) stats and skills. Just about every town has several shops loaded with new armor, weaponry, and items for this purpose alone. 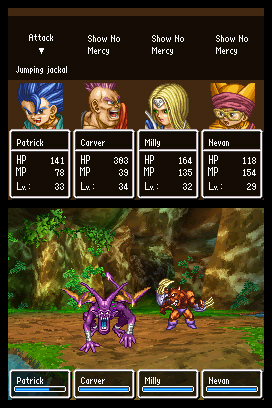 Using the currency system, players must constantly rack up money from battles or by selling the valuable spoils found throughout the game to keep each party member equipped and up to date with whatever current location in the game they might be in. Due to the heavy grinding, this shouldn’t be to much of a problem as looking for battles and treasures alike is a good way to save up for that top of the line armor or weapon that will take down the next big bad awaiting around the corner. Slimes are the most common enemy within the game and they hold many different forms, but you now have the ability to recruit these lovable monsters to your own party after certain battles (something we have sort of seen before in other titles). Each slime caught must be trained and treated the same as a standard party member as each have a lot of customization along with classes that can be taken advantage of which can best be used during some intense battles or even slime-oriented fights which take place in Slimopolis. If you have experience with and of the Dragon Quest Monsters titles or even games like Pokemon, this is actually one of the best add-ons in the game and capturing along with training reaps that same rewarding feeling as leveling up a standard party member. There is even more slime for those who crave it as well with a “Slime Slippin'” mini-game which lets players finally use their touch screens to flick slimes down a path to hit various targets and obtain a high score. At first I felt this mini-game was a bit generic, but soon I kept myself going back for more over time as this minor feature was an enjoyable way to take a break from the main quests at hand. As I mentioned a bit in the story section of this review, meeting all of the colorful characters in each town, dungeon, castle, or wherever you may be is half of what makes this title stand out. The developers behind this title really put emphasis on exploration, scattering chests which contain rare items and small quests with high-paying rewards all over the map. 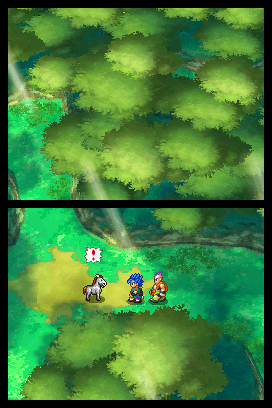 This feature, and honestly just about every element in Dragon Quest VI feels very familiar yet brand new at the same time as I feel I found a ton of memorable moments that others might think of as an afterthought to be just as memorable as the many encounters with bosses tied into the plot. Dragon Quest VI: Realms of Revelation is certainly not too different from the likes of IV or V battle wise, but there are a ton of little things that all add up to make it stand as it’s own title. With the heavy strategy that is required, some players might be a bit turned off as this title by no means holds the players hand, but for those craving a rich, old school approach to an RPG, there are few titles that can hold a candle to the full massive experience to be found here. 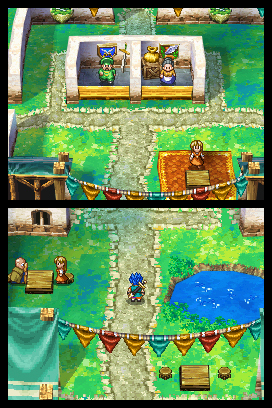 For a game that was originally released on the SNES, ArtePiazza did a fantastic job of giving a fresh coat of paint to the graphics, putting it on par in my opinion with the fantastically built Dragon Quest IX, which was only was released last year. Each town and environment feel different from the next for the most part due to little design changes that give each area a distinct personality. Since there are no cut-scenes for the story, quirky animations and dialogue bring each character to life, setting the mood for plot points within the game. Even though this title is a remake and should be treated as such, I would have however liked to have seen the proper equipment show up on each sprite (such as new armor, dresses, or capes), but in a way that kind of gives it even more of that retro charm and is more of an afterthought just a little ways in. If you have followed the series up until now, the music sounds familiar and gives the whole game the feel of a Dragon Quest title, as it should. There are also many new tunes to listen to, all of which can have you humming the melodies hours after sitting the game down. The sounds for the characters and environments also are vivid and give the visuals a bit more depth, so each action performed can be heard as well as seen in battles or by interacting with objects. 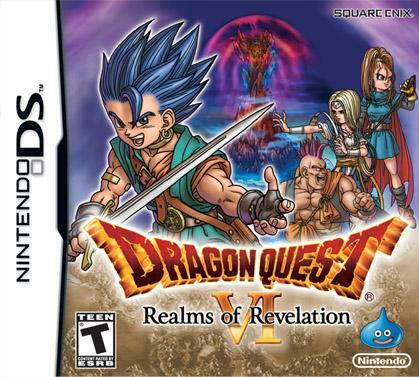 For Dragon Quest fans in general, there is no doubt that Realms of Revelation is a must-have for your collection. This title is full of the same battle system, charm, and quirky yet immersible plot that fans should expect. With a few minor features tacked in, there is almost an infinite amount of gameplay to be had here as customization is as rich as it ever was, adding even more strategies to the well developed machine that has been built upon since the first title in the franchise. If you are on the fence on giving this title a try, I recommend you take the jump as when it comes to a well built RPG in general for the DS, Realms of Revelation is easily one of the most assessable and enjoyable titles in the portable’s vast library.